The beauty ideal: All Black Errything featuring Luxemme. All Black Errything featuring Luxemme. I'm all for the occasional night on the town. Getting dolled up with the girls and sipping cocktails with friends - it's a great way to spend a Saturday night. 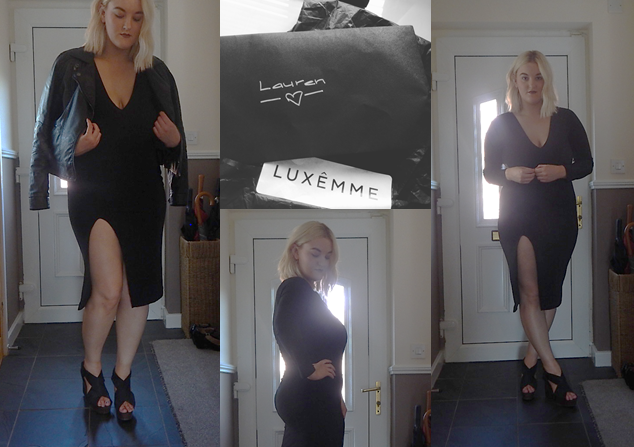 Every girl needs an LBD and one of my more recent additions is this fab little number from newer fashion brand Luxemme. Luxemme is a forward thinking fashion brand combining Parisian Chic with Manchester Street Style - a dynamite combination. Their pieces are edgy and sophisticated all at the same time. I've been loving having a flick through their website. The brand is based in Manchester and everything is incredibly affordable - great for fashion lovers on a budget. Anyway, Luxemme kindly gifted me this - the Macey Plunge Neck Dress (£28.00) and even though I wouldn't wear it as casualwear, you can definitely style it in any which way possible for a night out. Naturally, I've gone for a leather jacket and some wrap shoes to give it a more edgier feel, though the dress would work great with basic pumps or peep toes. Since we're fast approaching Autumn/Winter, a duster coat or bomber jacket would make a great throw-over for those blustery nights. The dress is only available in black, but who doesn't love black? It goes with everything and it's a hard colour to clash with. To quote the website, the Macey dress 'envelops old Hollywood glamour', with the deep V neckline and high thigh split I'd say that's a pretty accurate description. It also includes a tailored waistline to encourage an hourglass shape. The fabric itself is very forgiving and stretchy - no hard-to-breathe-in material here. I also want to credit Luxemme for their personalised touch to the invoice. They sent it in an addressed envelope - something I've never come across before from a fashion brand and it definitely works in making the receiver feel that little bit special. It was packaged beautifully. If you're looking to buy, Luxemme have kindly created a discount code for you guys - don't forget to enter LAUREN-384743 in the promo box for 10% off your order. Thanks again Luxemme for gifting me the dress, I'll definitely be making purchases in the future. This looks great on you! I totally agree, all black everything is the way to go. You look AMAZING!! The dress is gorgeous, and I love black clothing!